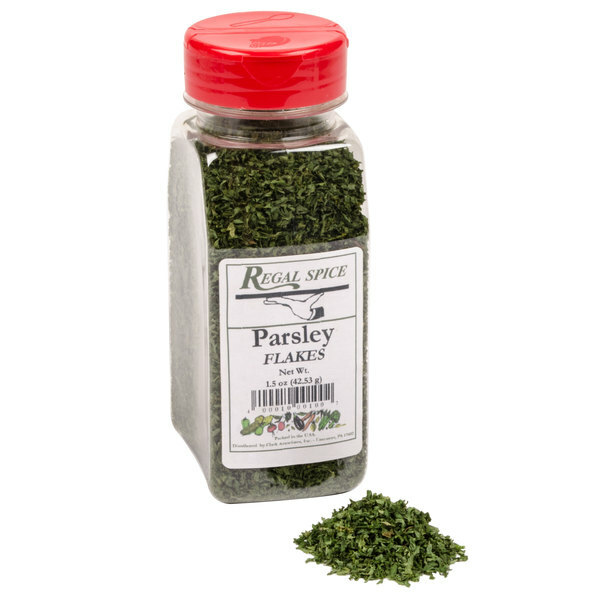 Regal parsley flakes are the perfect addition to any foodservice establishment. 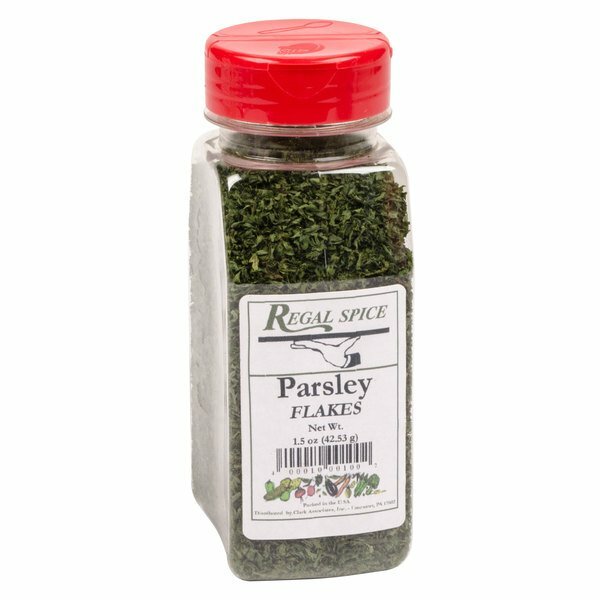 Enhance your dishes with the light and peppery taste of Regal parsley flakes. These dried flakes have a longer storage life than fresh parsley and will add a refreshingly crisp taste to your most popular entrees. A plant similar to anise, caraway, cumin, celery, cilantro, and dill, parsley will complement a variety of seasonings, enhancing the flavors of many other herbs. 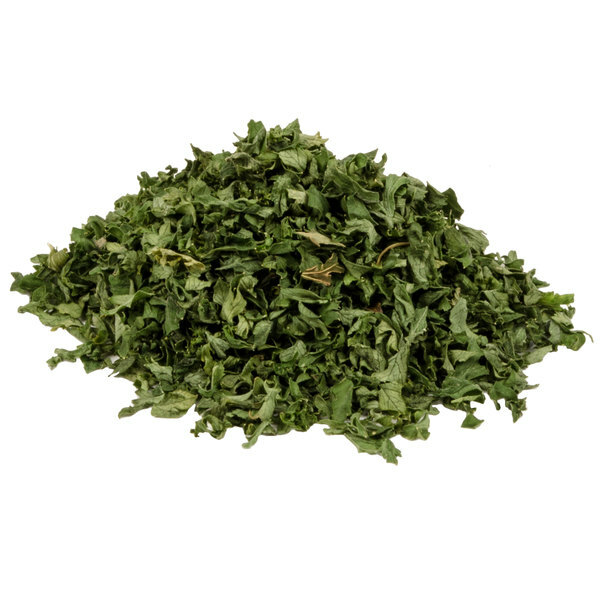 "We use parsley flakes in just about every soup, stew, meat rub and pasta dish. I always crush the herb gently in my hand to release some of the aroma. If added at the last minute it keeps it's nice green color. 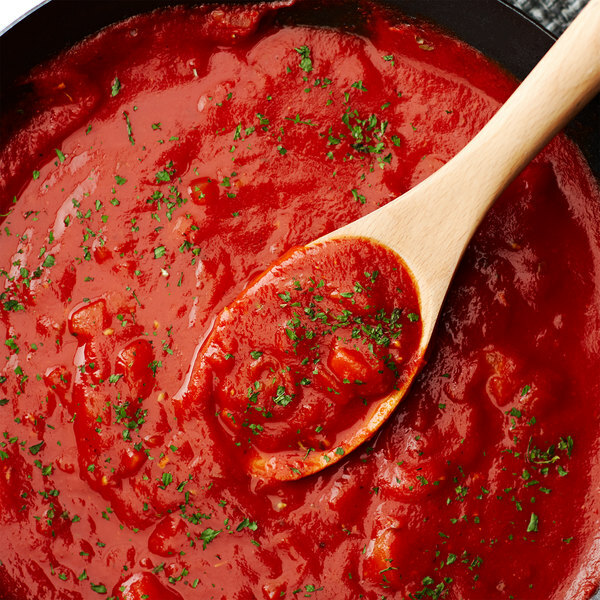 This is one of our pantry staples." To maintain its strong flavor, fresh parsley leaves were dried and crumbled to create these delicate flakes. You can crush these leaves before adding them to your cooked dishes or rehydrate them with oil and vinegar for a delicious dressing or marinade. With its bright green coloring and clean taste, parsley can be used as a garnish to add color and texture. 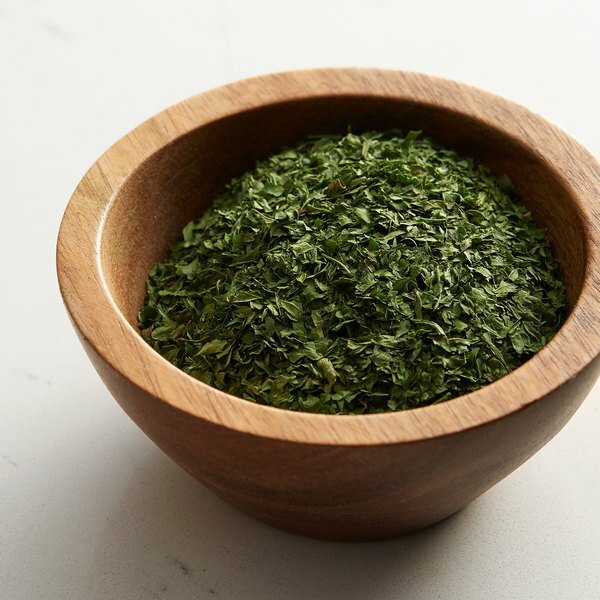 Parsley has a fresh, slightly bitter taste that naturally enhances the other flavors in your dish. Regal Herbs and Spices are a smart addition to any kitchen. This handy 1.5 oz. container is easily accessible for your cooking and seasoning needs. Be sure to check out our quantity discounts for even better wholesale savings! Item #: 10207105 Regal Parsley Flakes - 1.5 oz. 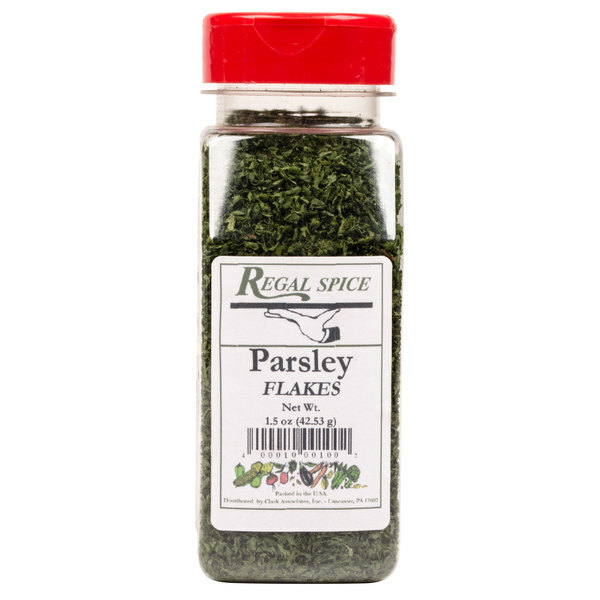 Item #: 10200106 Regal Parsley Flakes - 12 oz. 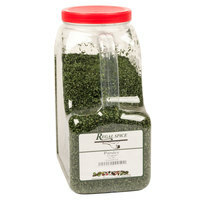 Regal Chives - 0.5 oz. Regal Crushed Red Pepper - 6 oz. Regal Fancy Paprika - 9 oz. Regal Celery Seed - 8 oz. Regal Whole Cloves - 6 oz. Regal Onion Salt - 16 oz. Regal Old Fashion Pickling Spice - 10 oz. Overall User Rating: Regal Parsley Flakes - 1.5 oz. These parsley flakes are decent, they have an alright flavor. They are of course very light and I think you can go through a lot, good addition for say carrots when having fresh parsley on hand is overly annoying. Parsley is not something I ever carry fresh so its nice to have this in a bottle whenever i need it. It's simply perfect as a dressing on many entrees. I love the regal brand seasonings! The parsley works well as a garnish on many of our dishes! I love the choice of larger or smaller quantity as well. Highly recommend this product! so often the fresh stuff does not last very long and having this is a lifesaver. this brand is amazing in flavor and freshness. I use this on everything I cook. Love these spices! Great parsley, fresh and smells amazing. Have made several italian dishes and all turned out great. Don't hesitate to buy. Containers are great. Stack well and seal tight. I’ve purchased many of the Regal brand spices and none have disappointed, including this one! They’re fragrant, full of flavor and the next best thing next to fresh herbs. 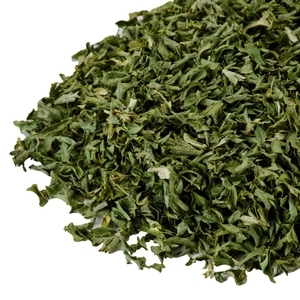 The parsley flakes are a great addition to soups, sauces, on chicken, etc. I also use them when I make my own spice blends. This parsley is a great fragrant herb that arrived shipped well. It was sealed and very dry. Love using this in recipes and I would highly recommend! In the past I have found dried parsley flakes to be virtually tasteless and inconsistent in color. However, I was pleasantly surprised to find these had a nice aroma and flavor. I will confidently purchase a larger quantity in the future. I love parsley flakes. I use it for baked chicken and use it as a marinade with other flavors. It is a good price for a great product! My "go-to" garnish for most dishes. 1.5 oz of parsley is a lot, and at this price it is a super bargain! Though larger quantities are discounted, I think this size container is going to work best for me. Easy to dispense and takes up little space. Amazing value, the container is stuffed. They have a nice, dark green color as well so they show up nicely. Many other brands of dried parsley have a light green hue and look very fake, but these look nice. Not as flavorful as fresh parsley, but then again dried parsley never is. These are nice big flakes, so add them a little earlier and give them time to soften in your sauce or dressing. Smells and taste alright but I found a fair amount of brown, shriveled unappetizing looking flakes. Also there seems to be a small amount of pieces of something that doesn't even look like parsley. White and reddish in color. Maybe I just got a bad batch. I might buy this again, I might not. I usually buy this from my wholesale club or dollar store but it’s cheaper to buy from WebstaurantStore. I use parsley for just about everything!! This works just as good as fresh parsley. This one has good flavor and taste it's smells great. I am using for cooking variety of curry. It's delicious herbs and great spice. Overall a good value for 1.5 oz dried parsley/ There was some parsley dust within the bottle, which is likely just do the larger packing and settling that likely occurred.